In five intergenerational events, explore the Old Testament tabernacle and learn how its amazing design and function point to Jesus and to God's desire to dwell with us. Explore the Old Testament tabernacle and learn how its amazing design and function point to Jesus and to God's desire to dwell with us. Build your own easy-to-make life-size model tabernacle,and conclude the series with an unforgettable tabernacle walk-through. Gather your whole church to share a meal, experience part of God's story through a drama or other activities, and talk and learn together around tables. 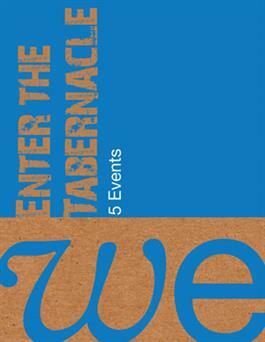 Order one box per church to get everything you need to plan and run WE: Enter the Tabernacle. An all-bases-covered event guide that makes it easy to setup and run your WE events. Includes full outlines of each event, supply and prep tips, and reproducible materials. The event CD: includes story scripts and other reproducible materials, PowerPoint slides, audio files, and promotional items.